For a student who loves science, sports and helping people, Rehabilitation and Movement Science provides an excellent career path. And if that path leads to an opportunity to accompany alpine ski racing champion Mikaela Shiffrin to slopes in Austria, Switzerland, Croatia, Italy and France, it’s a dream come true. It’s reality for Regan Dewhirst, Exercise Science ’13, Doctor of Physical Therapy ’15. She travels with Team USA in Shiffrin’s entourage, serving as personal physical therapist and athletic trainer to the three-time Olympic medalist and reigning World Cup champion. Dewhirst’s mission is to keep Shiffrin injury-free and prepared for arduous training with her coaches. She develops daily exercise regimens and guides Shiffrin through gym routines. On the race course, Dewhirst leads Shiffrin through warm up moves, balance drills, deep breathing and visualization. In each new training or race location, she creates a medical plan that includes local hospital access and ski patrol contact details. She stays on the hill with Shiffrin, observing the skier’s movement patterns and remaining vigilant to act quickly if the skier requires physical assistance. By “team,” Dewhirst means Team Shiffrin: Two dedicated coaches, a service technician to manage Shiffrin’s equipment, a publicist, Shiffrin’s mother and Dewhirst. The Team USA women’s head coach also checks in regularly. Dewhirst appreciates the interprofessional collaboration. This is Dewhirst’s first season with the team. She was working full-time at VASTA Physical Therapy and Sports Performance in South Burlington, Vermont, when the opportunity arose via email from Team Shiffrin, shortly after the 2018 Winter Olympics at which Shiffrin won two medals. The message cited Dewhirst’s education in the Doctor of Physical Therapy program at UVM and her advanced orthopedic residency at VASTA. Dewhirst speculates that Shiffrin encouraged her team to contact her. 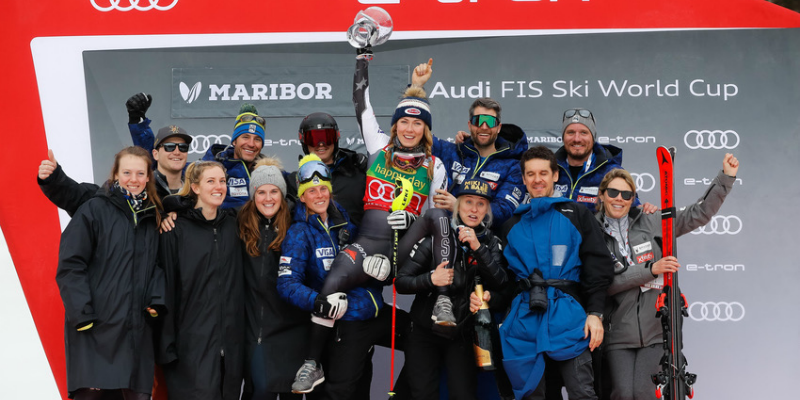 Shiffrin’s parents and siblings know Dewhirst’s, and the children skied, played tennis and went sledding together in New Hampshire when they were in elementary school. The girls raced for the same club in Lebanon, New Hampshire, before Shiffrin moved to Burke Mountain Academy in northeastern Vermont. As Shiffrin’s ski career took off, and Dewhirst got more involved in soccer, ice hockey and tennis, the girls went their separate ways. Although she admits to feeling nervous initially about taking on this new adventure, Dewhirst felt prepared for the job, thanks to her experience and education at UVM. She refers to her books and notes from classes in neuroscience, human performance and ergogenic aids and fondly recalls her experience studying abroad in Australia, where she honed skills in manual therapy and clinical decision-making. She also relies heavily on knowledge gained in a sports psychology course she took with Professor Jeremy Sibold, now the Associate Dean of the College of Nursing and Health Sciences. While at UVM, Dewhirst played four years on the UVM Women’s Soccer team and worked as a part-time assistant coach with the Green Mountain Valley School Ski Club at nearby Sugarbush Resort. These experiences shaped her understanding of competitive athletes’ needs. 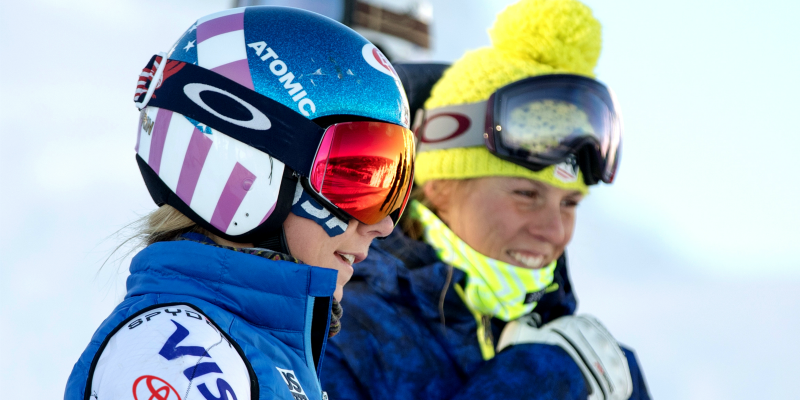 Last summer, Team Shiffrin invited Dewhirst to a 10-day ski training camp in Mammoth, California, to meet the team and become familiar with what her new job would entail. The post is seasonal, tracking 90 Alpine Skiing World Cup races on three continents. Dewhirst started in October with Giant Slalom race in Austria, and she’ll finish in March in Andorra. The itinerary included stops in Bulgaria, Norway, Canada and Killington, Vermont. She plans to return to VASTA when the season ends.